The Southwest Chief in Colorado. Photo courtesy of Wikimedia Commons. I knew enough to make conversation, and by the time dessert arrived, I had learned how to finish, or fatten, a calf with corn. I’ve ridden Amtrak since college, and, in recent years, logged nearly 100,000 miles researching and promoting a book on rail policy. Dinner with Amos was one of my more remarkable encounters. But it wasn’t entirely unusual. During meals in the diner, where Amtrak practices community seating, Americans who might never otherwise encounter one another sit face to face at tables and break bread. All mass transit brings Americans together, of course. When we travel, the self-segregation we otherwise practice—by race, income, education, politics, culture, religion, class, or political tribe—evaporates. But a train is special. Unlike a 20-minute commute on a city bus or subway, or an airline flight in the cramped seat of a fuselage, a train requires the commitment of time and space. Passengers ride together for hours, even days, and during the journey have the liberty to move about, eat and drink, and socialize. Trains also have an intimacy with landscape. Incapable of negotiating steep topography, they follow valleys, hug rivers and oceanfronts, and strike out across plains and desert basins. Train travel induces a sort of reverie—a hypnotic feeling of being adrift on the geography of America. Passengers, many of whom are seeing the country for the first time, marvel at its beauty, diversity, and exoticness. And those feelings carry over to an inclination to engage one another and embrace the same diversity within the rolling coaches. So while I still fly on airplanes, if I can work a long-distance train into my travels, I get aboard. When I want to feel and hear the zeitgeist of America, I get on a train. Early in the Great Recession, on The Empire Builder—running from Chicago to the Pacific Northwest—I encountered jobless men converging on North Dakota with just a few dollars in their pockets and the hope of work. In Williston, men who had arrived months earlier in the oil patch boarded the train to go home for a few days and see family before heading back to sprawling “man camps” erected by Halliburton. A roughneck having a beer in the observation car told me a woman was arrested for prostitution the day before at his man camp. Observing America through train windows. Photo courtesy of James McCommons. The train rolled past campers with no running water parked out on the frozen prairie and rigs flaring off natural gas-like colossal candles. The snow and sky shone red and apocalyptic. He had not been home for weeks. 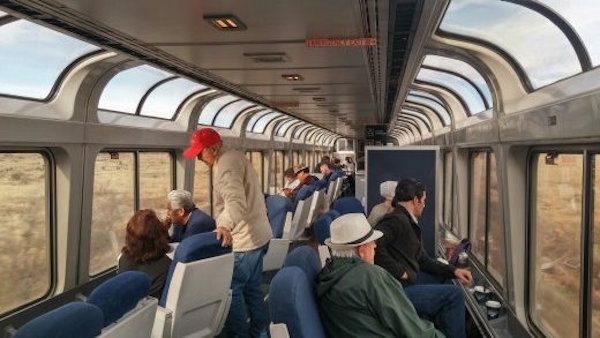 On The Sunset Limited in New Mexico, I chatted with a Texan returning home from Los Angeles after being checked over at Kaiser Permanente. He tapped his chest. We watched pronghorn antelope sprint away from the train and mule deer standing in dry washes. Inwardly, I groaned. Is anyone just a grunt, a cook, or a clerk anymore? Over the years, I’ve dined with school teachers, a deputy sheriff, a distraught widower, an apprentice mortician, a veterinarian recruiting for slaughterhouses, a priest who discovered the call in Vietnam, an aging movie star, and a wheezy 98-year-old who was a door gunner on a Flying Fortress. He laid natural gas pipeline in Oklahoma, lived in motels, ate Chinese and take-out pizza each night, and guzzled gallons of beer. Flush with money, he apparently lived a lonely, haunted life. Always, I take late meal reservations so if my companion(s) are compelling, we can linger over coffee or a glass of wine. The dining car stewards are in no hurry to bus the tables and throw us out. Not all meals are a pleasure. Teenagers remove their retainers at the table, young lovers speak only to one another, people text on their Smartphones, passengers come to the diner still wiping sleep from their eyes, and others have no filter for what passes as dinner conversation. Leaving St. Louis, I met two sisters heading west to visit a son. The mom said, “He’s such a good boy, called me every day when my husband passed.” The boy had testicular cancer when he was 16 but had still impregnated his wife on two occasions. Unfortunately, the poor dear miscarried both times. She prattled on and on. As my father used to quip, some people never come up for air. I gobbled my food and fled the car. I listen, nod, and try not to be judgmental or revealing. If the conversation grows intense or tedious, there is always the window and a “Hey look at that” as a way to change the subject. We could be looking at a hillside of wind turbines in Iowa, iceboats racing on the Hudson River, dapper worshipers exiting a corrugated tin church in Mississippi, delinquent kids in New Jersey heaving rocks at the train, kudzu vines strangling telephone poles in Georgia, or homeless men huddled in cardboard shacks beneath I-5 in Seattle. A train trip unspools in an endless stream of images and words. And if you listen well, you hear America. James McCommons teaches journalism and nature writing at Northern Michigan University. He is the author of the 2009 book Waiting on a Train: The Embattled Future of Passenger Rail Service.